A pair of four run innings in the fifth and sixth against two Spokane Indians pitchers saw to that. 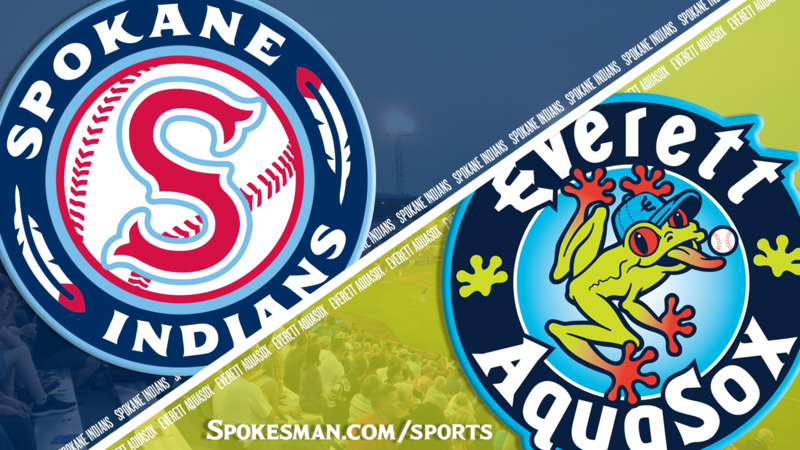 Connor Kopach hit a two-run double in each of those innings and the Everett AquaSox ended the Indians four-game winning streak, 9-5, in the finale of a three-game Northwest League series at Avista Stadium on Thursday. Everett’s Geoandry Montilla added a two-run homer in the sixth inning. Jake Latz was making his third start for Spokane (6-8). He had allowed three earned runs on seven hits and three walks over 9 2/3 innings with 13 strikeouts. Latz (0-1, 5.40) was not as sharp on Thursday. He was responsible for the runs in the fifth and exited with one out in the sixth following his third walk of the night. All told, he gave up six runs on seven hits and struck out three. Reliever Sergio Suarez came in and his sixth pitch to Montilla was blasted to straight center for a two-run homer and 7-3 Everett lead. All that said, the Indians still had their chances late. Down 9-4, the Indians picked up a run in the ninth. With one down, Starling Joseph doubled and scored on a single by Tanner Gardner. Curtis Terry then singled to put the tying run in the on-deck circle, but Cristian Inoa looked at strike three on the outside corner and Hasuan Viera grounded out to end it. The Indians started off well enough, getting on the board right away in the first inning. With one down, newcomer Troy Brown laced a double to the base of the wall in left center. Two batters later, Gardner (3 for 3, three RBIs) lined a single to center and Brown raced home with the game’s first run. Everett (8-6) got that one back in the top of the second. Matt Sanders led off with a single and went to third on a single by Bobby Honeyman. Geoandry Montilla grounded into a double play, but Sanders scored on the play to tie it 1-1. Spokane got runners on the corners with one down in the second, but Caraballo struck out Tyler Depreta-Johnson and J.P. Martinez in succession to get out of the jam. In the third, Dixon bunted for a base hit and and one out later, Gardner clubbed one high off the wall in right center, easily scoring Dixon with Gardner chugging into third with a triple. Terry followed with an RBI single to make it 3-1. Meanwhile, Latz cruised, retiring nine in a row after the Everett run through the fourth inning. Caraballo got two down in the fourth, then walked Dixon and Joseph. Everett manager Jose Moreno made a pitching change, calling on Noah Zavolas, an 18th round pick of the Seattle Mariners out of Harvard. Zavolas won the battle with Gardner, running the count full before sneaking a breaking ball past him for strike three to end the threat. Latz’ good time ended in the fifth. Bobby Honeyman reached on a single and after a strikeout, Jansiel Rivera crushed an 0-2 pitch well over the picnic area and batting cages beyond the right field fence and into the parking lot. The two-run homer tied it at 3-3. Nick Rodriguez followed with a single to left and Charlie McConnell walked. That got pitching coach Jono Armold out for a chat and arms loosening in the pen. Whatever Armold said didn’t help. Connor Kopach ripped a line drive to left center that made it to the wall for a double to plate both runners. The Indians avoided further damage as Starling Joseph laid out for a catch in right center to rob Ryan Garcia of extra bases for the final out of the frame. After Spokane went in order in the bottom half, Latz came back out for the sixth. He struck out Matt Sanders but followed that with a walk and Holmberg called for relief. Montilla’s blast to straight center off Suarez gave Everett a four-run lead. Suarez picked up a strikeout, but hit two batters in a row then gave up a double off the wall in left to Kopach that cleared the bases which made it 9-3. The Indians got one of those runs back in the seventh. Gardner drew a walk and Terry – who came in leading the NWL in homers with six – almost had another one, as his drive to right center kept carrying until knocking high off the wall in front of the scoreboard. Reliever Royce Bolinger struck out the side in the eighth and ninth to give the Indians a chance late. Published: June 28, 2018, 9:53 p.m. Updated: June 28, 2018, 10:57 p.m.